Transparent displays have a variety of potential applications: one may use a storefront glass or a subway window as a projection screen, or display navigation and dashboard information while looking through the windshield of a car or plane. 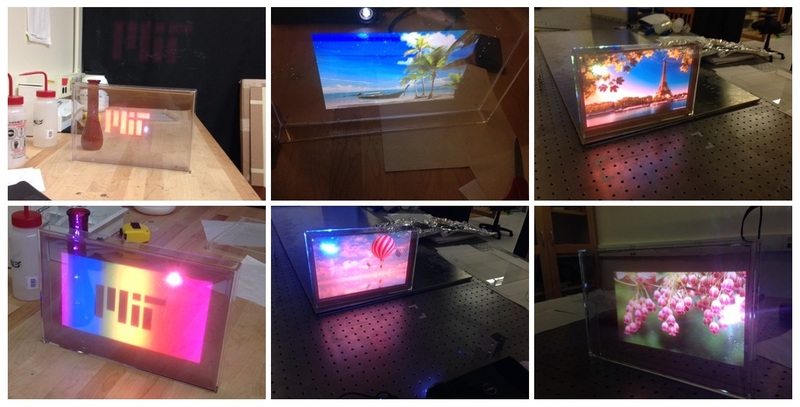 A number of technologies have been developed for such displays, but each has certain limitations. 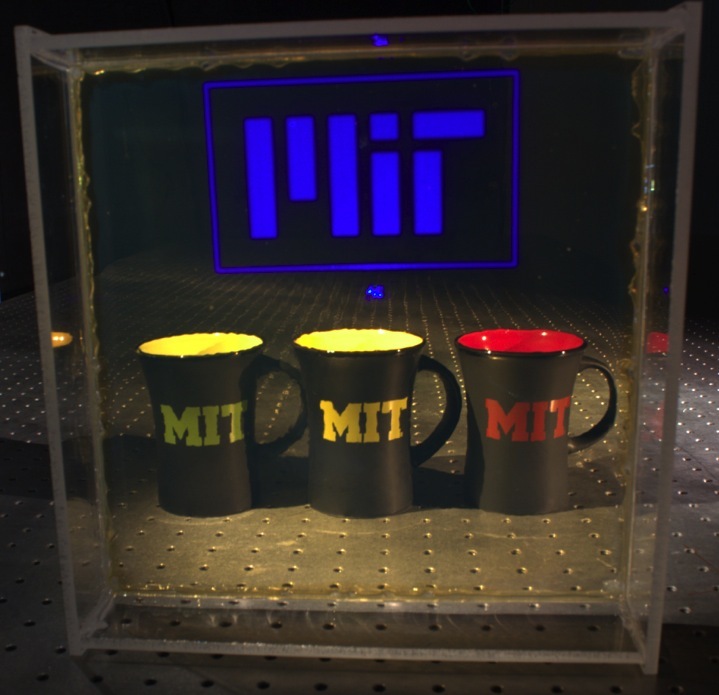 We came up with a new kind of transparent display using the resonant scattering of nanoparticles. The screen consists of a transparent polymer embedded with designed nanoparticles. The nanoparticles selectively scatter the targeted wavelength of light that we project (therefore acting as a screen) but let other wavelengths of light pass through (therefore appearing transparent). Such screens are merely doped plastic foils. They are simple to manufacture, of low cost, scalable to large sizes, and have wide viewing angles, making them attractive for certain applications. "Transparent displays enabled by resonant nanoparticle scattering," Chia Wei Hsu, Bo Zhen, Wenjun Qiu, Ofer Shapira, Brendan G. DeLacy, John D. Joannopoulos, and Marin Soljacic, Nature Communications 5, 3152 (2014); doi:10.1038/ncomms4152. Demonstration videos of the screen are available: video1, video2. Peekaboo... I see through! by Paola Rebusco (MIT). Seeing things: A new transparent display system could provide heads-up data, by David L. Chandler (MIT News Office); there is also a video by Melanie Gonick. This work was featured on MIT home page and Nature home page on Jan 22, 2014, and on the Feb 2014 issue of Nature Materials. It is also mentioned by BBC News, ABC News, Popular Mechanics, CNET, Engadget, The Huffington Post UK, Daily Mail, Boston Magazine, Business Insider, GigaOM, Science/AAAS, MRS Materials360, ScienceDaily, Phys.org, Science World Report, Photonics.com, NovusLight, Nanotechnology Now, Radiology Daily, Gizmag, Nanowerk, International Business Times, Business Standard, The Engineer, Daily Tech, Tech Times, Science Newsline, Ubergizmo, Technology.org, Computerworld, Examiner, OFweek, Science Codex, Slashdot, Brazilian Mail (Portuguese), Scinexx (German), Digital Signage (German), SINC (Spanish), sophimania.pe (Spanish), notizie.tiscali.it (Italian), QQ.com (Chinese), EEPW.com.cn (Chinese), cnBeta.com (Chinese), opticsky.cn (Chinese), twwtn.com (Chinese). All the material above relates to our work published in January 2014. In what follows below, we describe some of our work since then. Figure above: While silver nano-particles can be designed to scatter (mostly) in blue, gold nano-particles can be designed to scatter (mostly) in red, as we have done in the top-left panel. Top-center, and top-right panels show that a display designed for blue works quite well for green also, because green is not far from blue in wavelength, and because the silver particles used for that display do not have a very narrow response. In contrast, red color appears faint, but still somewhat visible (bottom-center and bottom-right). Left panels show a screen optimized for red, whose surface is also substantially more smooth than the previous screen, due to a different polymer fabrication process; it is a high-concentration ethanol colloid of Silica-coated gold nanoparticles dispersed in methylmethacrylate resin which is chemically polymerized to polymethylmethacrylate under a Mylar screen to make it optically smooth; the optical smoothness implies that this screen has much less apparent "waviness", compared to the original screen. Figure above: By embedding nanoparticles into a polymer, and passing light through the material of the frequency that matches the resonance of the nanoparticle frequency, we can implement static illuminated transparent displays, scattering the resonant light only and exactly where the nanoparticles are deposited. Left: sketch of how the principle works. Center: unilluminated samples (with further work, the faintly visible star-shapes could be made nearly invisible). Right: samples illuminated with blue light (top), or red light (bottom); only the part of the sample where the particles are scatters the light, and hence the star-shapes are now clearly visible. Figure above: Same principle as the previous figure, but now implemented with letters "MIT". Figure above: Imagine a transparent display which when observed from the "front" shows an image, or a movie, but when observed from the back appears like a completely clear piece of glass; imagine a window of a restaurant, or a shop on which the passersby can be shown images of interest, but the people inside see only a perfectly clear window. A display of this type might also serve as a privacy screen. To enable such a display, we combined the display discussed at the top of this web page with a notch filter. An optical notch filter is a band-stop filter or band-rejection filter that transmits most wavelengths unaltered, but reflects those in a specific range. In the inset on the right, we show transmittance of a notch filter that reflects blue color, and allows all other light to pass through). The figure presents the principle of the operation of such a transparent display, enabled by nanoparticles deposited onto a notch filter. Light is incident onto the nanoparticle. Assume that the nanoparticle has a localized surface plasmon resonance at wavelength lambda (blue) which is exactly the center wavelength of the reflection window of the notch filter. Light from the far field incident onto the nanoparticle gets scattered for the first time, gets reflected, and gets scattered by the nanoparticles for a second time. Therefore, the scattering cross-section of the nanoparticle will be doubled, resulting in two times brighter screen than usual, when observed from the front (i.e. when observed from the projector's side), but when observed from the back, image is not visible at all: only a clear screen appears. Demo of such a system is shown in the figure below. Figure above: Demo of a one-sided display described in the previous figure. Top panels: camera is zoomed onto the screen. Bottom panels: camera is zoomed onto the objects behind the screen. Panels on the left: seen from the front of the notch filter: the letters “MIT” are clearly visible, and in fact (as expected) enhanced at the position where the filter is. 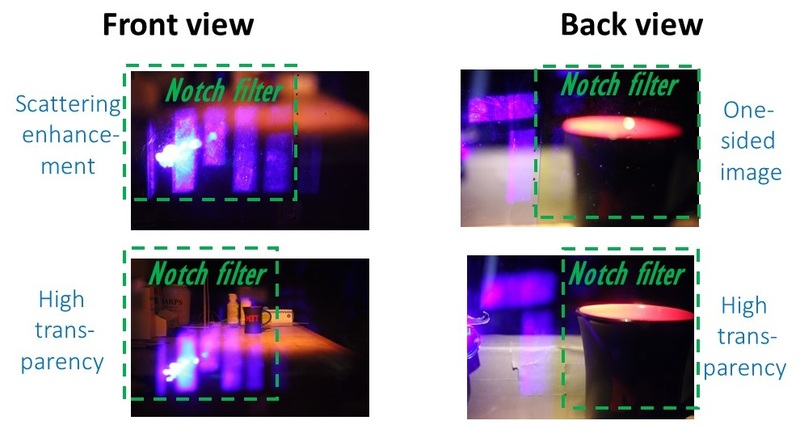 Panels on the right: seen from the back of the notch filter: “MIT” letters are invisible as seen from the back of the filter, but the screen is still transparent.